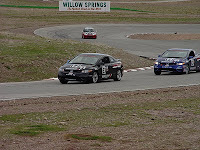 Team Honda Research Drivers Take Convincing Victories in the Touring 3 and Showroom Stock B Classes at Big Willow. Team Honda Research (THR) drivers Sage Marie, Lee Niffenegger and Matt Staal drove brilliantly to collect maximum points for the 2010 national championship run-offs during the February 28th Sports Car Club of America National event at Willow Springs International Raceway. Marie won the Touring 3 (T3) class, while Niffenegger and Staal swept the Showroom Stock B (SSB) class with a 1-2 finish. 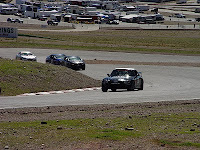 The race at Willow Springs, a.k.a. Big Willow, marked the second consecutive high-speed race for the Team Honda Research (THR) drivers and their vehicles. Although the roval (road course + oval = roval) at Auto Club Speedway in Fontana and the big track at Willow Springs are both fast, their layouts are completely different. At Fontana, speeds of 130 miles per hour or more are reached as the cars storm down the back straightaway. While speeds at Big Willow are well over 100 mph, the shorter course length and flowing nature of the track give drivers little time to rest. Niffenegger calls it a "fun 'old-school' track" that he considers one of the bravest in North America, with Mosport in Canada being the other. Inclement weather presented the Team Honda Research drivers with their first challenge of the weekend. The precipitation necessitated a switch to rain tires for the first practice session of the weekend. Two-thirds of the way through practice, Marie experienced trouble with the throttle body of his #4 Honda Racing/HPD/BFGoodrich Tires Honda S2000. This would sideline Marie and his S2K for the rest of the day. It also meant he wasn't able to qualify, and would have to start from the rear of the field for the race. Marie and Staal would later trek down to Torrance to pick up a borrowed throttle body from Hondata’s Doug MacMillan, then back to the track in Rosamond to perform the (quick) repair on Saturday evening. Track conditions were better for qualifying as the rain waited until the end of the session to return. Staal qualified his #53 Honda Racing/HPD/BFGoodrich Tires Honda Civic Si Coupe second and Niffenegger placed his #42 Honda Racing/HPD/BFGoodrich Tires Honda Civic Si Coupe third. 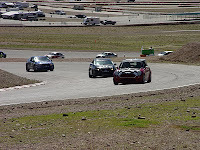 Tom Brecht grabbed the pole in Showroom Stock B with his supercharged #25 R53 MINI Cooper S. Unlike in the race at Fontana, THR drivers would not be starting from the pole positions in their classes in Sunday's race. Clear, sunny skies presented themselves for the morning warm-up and the race. With the previous day's troubles (rain and a bad throttle body) behind them, the Team Honda Research drivers were poised to drive their way to the tops of their classes. The Showroom Stock B contenders would begin the race in the middle of the pack, while Marie would have to carve his way through many slower vehicles to return to the front of the field. Staal spent the early laps of the SSB race looking for a way around Brecht's MINI. After a few more laps, Niffenegger caught and passed Staal and set after the MINI. In fewer than two laps, Niffenegger took the SSB class lead and never looked back. In the initial stages of his race, Marie safely carved his #4 Honda S2000 through slower traffic consisting of cars in less powerful classes. 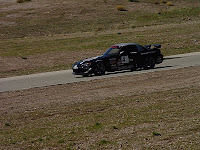 His primary competition for the weekend was the Mazda RX-8s driven by Lynne Griffiths and Michael Sullivan. Marie's best lap of 1:36.461 was significantly faster than the 1:37.777 and 1:39.834 Griffiths and Sullivan could muster, respectively. (For reference, Niffenegger clicked off a 1:37.641 and Staal turned a 1:38.078 in their Honda Civic Si Coupes.) With the speed he had, Marie made it appear easy to reel in and pass his Touring 3 division competitors. He was also unaffected by the spins of third-place finisher Steve Schmidt and overall race winner Ryan Cashin in their C5 Chevrolet Corvettes. Back in SSB, the highlight of the second half of the race was Staal's pass of Brecht's MINI for second place, and his defense of the position during the run to the checkered flag. 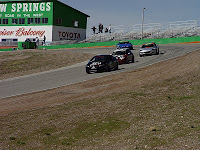 Niffenegger observed that the MINI couldn't keep a consistent pace and fell off as the race progressed. When the race-leading Touring 1 (T1) class Corvettes came to lap the SSB field, Staal keenly realized he could have a great opportunity to get a big run on the MINI as Brecht would have to acknowledge the blue flag and let the faster traffic pass him. Utilizing one of the Corvettes like a fullback, Staal followed a lead block to catch and get around Brecht's Cooper S.
Because of the layout of the track, the high-speed right turns taxed the left side tires. "There was one lap when things got hairy for me in Turn Nine," Staal shared after the race. "It felt like I ran over some of the marbles." Staal successfully kept the MINI behind him for the remainder of the race to secure the SSB 1-2 sweep for THR. Next up for the Team Honda Research drivers is another fast track, the long straights and fast turns of Thunderhill Raceway on March 13-14. Staal considers it one of his favorite tracks and should have a strong showing there. Marie and Niffenegger are also positioned to do well and keep their winning streaks intact. Matthew Staal earned two top five finishes at Pocono Raceway in Pennsylvania to join fellow Team Honda Research-West racer Sage Marie in qualifying for the 2009 SCCA National Runoffs. TORRANCE, Calif. – August 18, 2009 - Team Honda Research-West took another step toward realizing a national championship dream when Matthew Staal became the second THR-W driver to qualify for the 2009 Sports Car Club of America National Runoffs. Driving a showroom stock SSB class Honda Civic Si, Staal battled a large field to finish 5th and 4th respectively at Pocono in national qualifying races on Saturday and Sunday. Staal’s strong weekend allows him to join fellow THR-W regular driver Sage Marie, who qualified for the runoffs in a T3 class Honda S2000 with a second- place finish in the Southern Pacific Division championship . The drivers, who are running in conjunction with Honda Performance Development’s newly created Honda Racing Line, will race at Road America in September at the 2009 SCCA National Runoffs. Staal, who focused on endurance racing in 2007 and 2008, quickly got up to speed by qualifying 4th in class on Saturday. 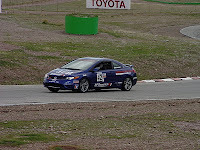 During the race, mechanical issues slowed the Civic Si forcing Staal to focus on smooth and consistent laps, and saving the car for the second race. On Sunday, Staal improved his qualifying to 3rd position. He was able to utilize the Civic Si’s strong acceleration to move into second place before contact interrupted his challenge for the lead. In turn one, Staal was hit on the passenger side causing him to nearly spin in front of the field of cars. Staal kept his foot in the throttle and managed to recover the severe over-steer, staying with the front runners to finish fourth. These two strong finishes following Staal’s second-place run at Nelson Ledges Raceway in Ohio in July earned him a starting position in the national runoffs. Matthew Staal is looking forward to representing Honda Racing/HPD along with fellow drivers Lee Niffenegger, Chad Gilsinger, Inness Eisele, Sage Marie and Bob Boileau at Road America for the SCCA National Championships on September 24-27, 2009. Team Honda Research-West is proud to represent, test and use products from the following companies: Honda Research & Development Americas, Inc., American Honda Motors Corporation, Honda Performance Development, Toyo Tires, The Westside Group, H&R Springs, Brembo Sport, Baja Designs, Inc., AEM, Traqmate, Hondata, APR, Exedy, Recaro, Red Line Oil, Tyga-Box Inc., HMS Motorsport and Schroth Racing safety harnesses, Goodridge, ASR, Porterfield, King Motorsports, Aquapel Glass Treatment by PPG Industries, Inc and K1 Speed Karting tracks. If you would like more information about THR-W please contact John Whiteman at (310) 781-6532 / jwhiteman@honda.hra.com. You can also find the team at http://thrw.hra.com or on Facebook. Team Honda Research West is proud to announce that its Acura RSX-S race car will be displayed along side two of the Kogi BBQ trucks that will be at the Honda campus on Thursday, July 9 from 12 PM to 3 PM. Look for all three vehicles on Harpers Way in Torrance, CA! Team Honda Research West (THR-W), in association with K1 Speed Torrance, gladly presents the #24 THR-W Acura RSX-S on display at the K1 Speed in Torrance CA. Look for the #24 car in the lobby of one of Southern California's premiere go kart franchises.